"My Dear Wife and Children: Civil War Letters from a 2nd Minnesota Volunteer"
LAKEWOOD, Wash. - Aug. 22, 2014 - PRLog -- Strategic Book Publishing & Rights Agency is pleased to announce the release of its newest title, My Dear Wife and Children: Civil War Letters from a 2nd Minnesota Volunteer, by author Nick K. Adams. Filled with poignant images of a soldier’s daily activities, his fears and exhilarations in military conflict, and his thoughts and emotions as war kept him far from his family, these historical letters offer a fascinating insight into the personal experiences of a common soldier in the American Civil War. them? Which of his experiences can he tell? Should he share his feelings of separation and loneliness? And how does he answer their questions about his return? In this case, the man never returned, and his letters were the last mementos his family had to remember him by. 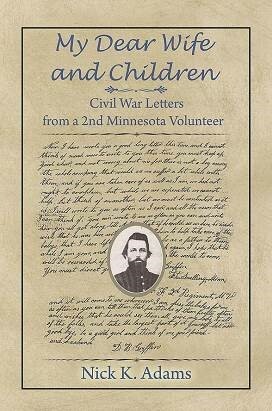 His questions are as relevant today as they were over 150 years ago, when David Brainard Griffin, a corporal in Company F of the 2nd Minnesota Regiment of Volunteers, wrote them to the family he left behind on his Minnesota prairie homestead while he fought to preserve the Union. His letters began in September 1861, and continued until his death in Georgia during the Battle of Chickamauga in September 1863. One hundred of these priceless documents were preserved and passed down in his family. They have been carefully transcribed and annotated by his great-great-grandson, Nick K. Adams, allowing further generations to experience Griffin's answers to these questions and to many more. Nick K. Adams is a retired elementary school teacher, an avid Civil War re-enactor, and historical speaker who lives in Washington State. http://sbprabooks.com/NickKAdams or at www.amazon.com or www.barnesandnoble.com.